Memorial Day at Home Again with hot dogs, wine and prizes. I did not know I was soon to understand it’s true meaning. plane in commemoration of D-Day. in to a country unknown to them, and often way off course. And immediately went into combat. Oftentimes facing certain death. way for our forces to push into Europe. bucket-list, I am so much better from having made the trip. My most vivid impression was watching the chic vendors simply sitting in the sun, chatting, drinking wine, and enjoying the pleasant day. What a way to do business! And to be surrounded by furniture that was made in a different century, but still timeless…well…let’s just say I showed remarkable restraint not to bring it all back home with me! It’s time for ‘Les Shopping.’ Oui-Oui! A WOWZA look…Hand embellished leaf art, $295 ea, 42×62. Crushed velvet ivory sofa, $695, 92″w. Brand new aqua club chairs, $495 ea. 32″w. Bronzed mirror cocktail table, $236, retails $475. stand up to coastal lifestyles. $1,895, 88×88. Darling floral painting, $295, 42×52. Modern floor lamp, $85. Navy is hot hot HOT…Crisp navy club chairs piped in ivory, $495 ea. 32″w. Designer lamps, $125 ea, 25″h. Underwater fern art, $265, 31×55. Pottery Barn cocktail table, $112. Koi ginger jars, $85 ea. These Stressless style chairs won’t last long at $445 ea, 32″w. Reclaimed wood console table, $1,036, retails over $3.000. 89.5x22x33.5″h. Murano glass lamps, $112 ea, 37″h. Floral art, $325, large scale, 52×62″h. Large white ginger jars, large $157 ea, small, $85 ea. Coastal giclee, $295, 46″ square. Custom made wine rack, $265, retails $1,000. 48×13.5×30.5″h. Gorgeous orange Greek-Key lamps, $175, ea. 30.5″h. BRAND NEW swivel gliders in coral, $495 ea, 34x34x32″h. hot minute…$595, 80″w. Pillows, $25-$42. LOOK UP… WE HAVE THE BEST CHANDELIERS! JUST IN…Blue sectional, $1,195, 113×82.5″ chaise side. Landscape abstract, $155, 60×24″h. Seagrass coffee table with wooden legs , $175, 32x32x16″h. Throw pillows, $28-$42. Handsome, confident pelican giclee, $395, 41.5×48. Floral oil painting, $275, 42″square. Seafoam lamps, $112 ea, 27″h. Wormwood sideboard, $476, 45.5x20x29.5″h. Khaki swivel barrel chairs just $295 ea, 33x32x29″h. This Chinoiserie cabinet won’t last long at $595, 55×18.5×33″h. White ceramic lamps, $125 ea, 31″h. Vibrant sailboat art, $295, 48×36. Just in on consignment, this 60″ distressed dining table is a STEAL at $495! Wooden lamps, $85 ea, 28″h. 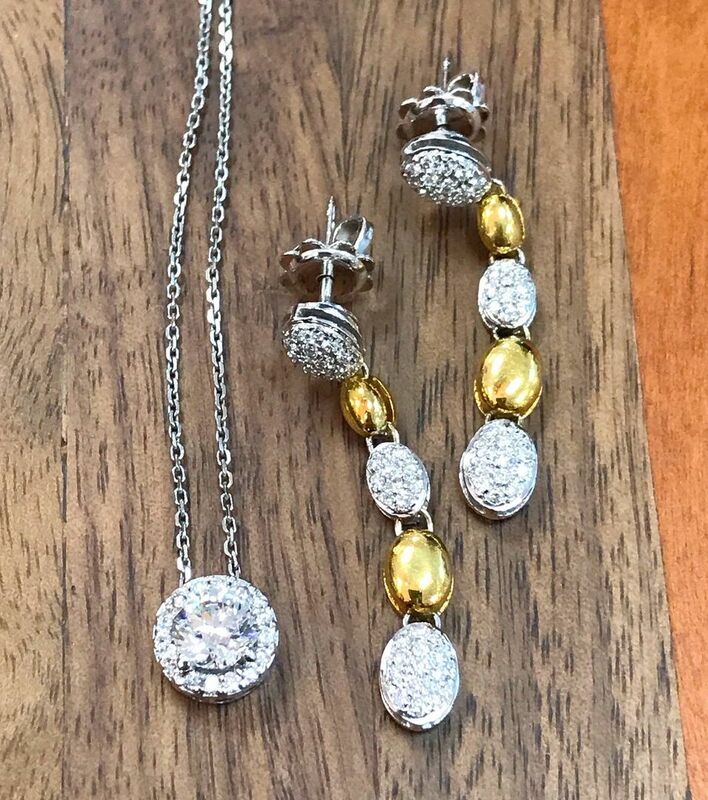 Accessories, $12-$22. Adorbs ivory settee, $395, 50.25x30x34.75″h. Shoreline giclee, $495, 57×32. White 2drw console, $220, 40x15x31.5″h. Grey tufted storage ottoman, $292, 31.75″ diameter x 17.5″h. Handsome almond sofa just $695, 87″w. Hand embellished dogwood art, $195, 40″square. Table designer lamps, $145 ea, 29″h. Queen headboards on parade…at STEAL prices! Such a unique cabinet, distressed wood with metal pulls, $525, 47x24x30’h. Lamps sold, sorry. ​Highly textured boat art, $295, 48″ square. On consignment…highest quality soft blue down filled chaise lounge, a deal at $325. 32x65x36″h. Great looking linen chofa piped in chocolate, $895, 92×65. Original abstract, $175, 41.5″ square. Seafoam lamps with seagrass shades, $125 ea, 35″h. Such a fan of this distressed qua-trefoil chandelier with gold undertones. Sells for $773 on Wayfair, our price $295! This hand inlaid wooden mirror in neutral tones will be a subtle but rich accent to any wall! $195 30×40. 😍Green swivel chairs, $395 ea, 28.5×32.5×34”h. Ivory & gold mirror, $395, 26.5×70”h. Uttermost art, $225, 45×52. Linen recliners, $445 ea! 29x35x39”h. Sea foam lamps, $112 ea, 30”h. 30” black wooden table, $245, 28.5”h. Is owning a piece of designer jewelry on your bucket list? We got you. For less. Much less. Lorenzo sterling silver and 18ky gold ring, $195. 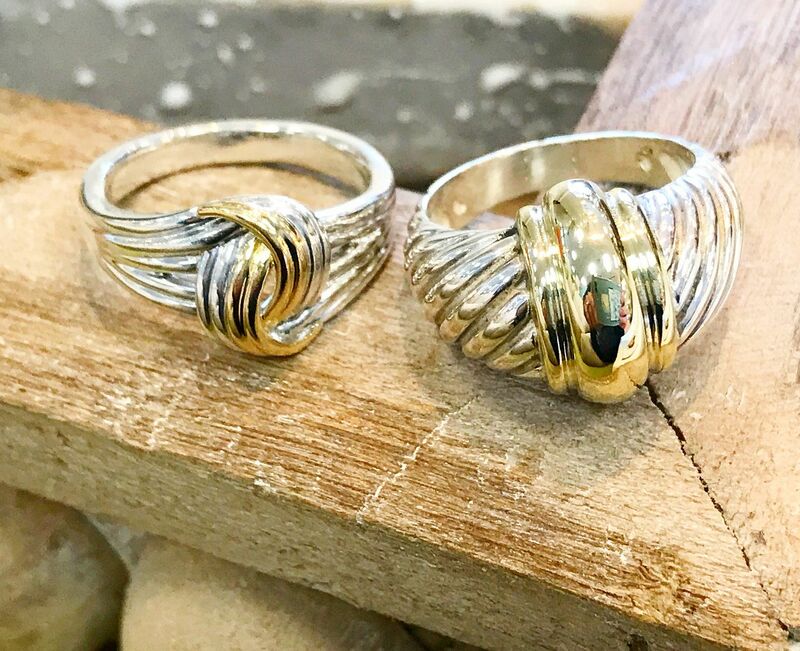 David Yurman sterling silver and 18ky gold ring, $295. 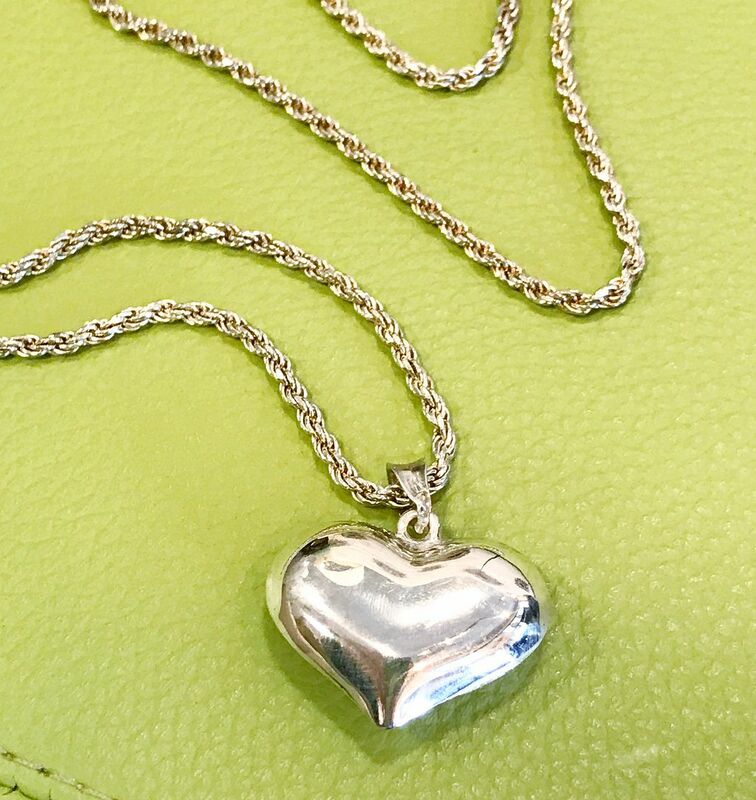 sterling silver and 18ky gold, $295. 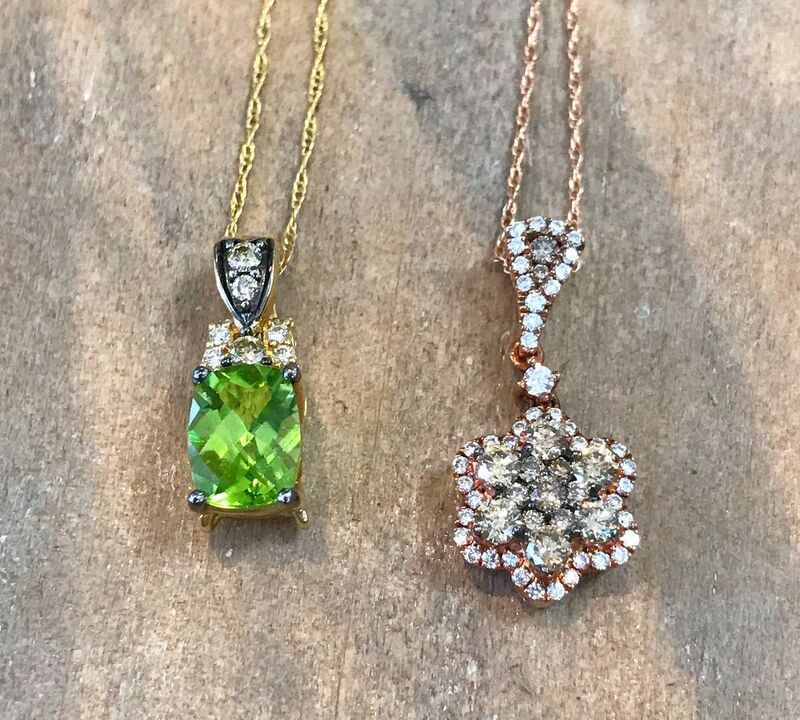 Lollipop peridot and 18ky gold necklace, $415. 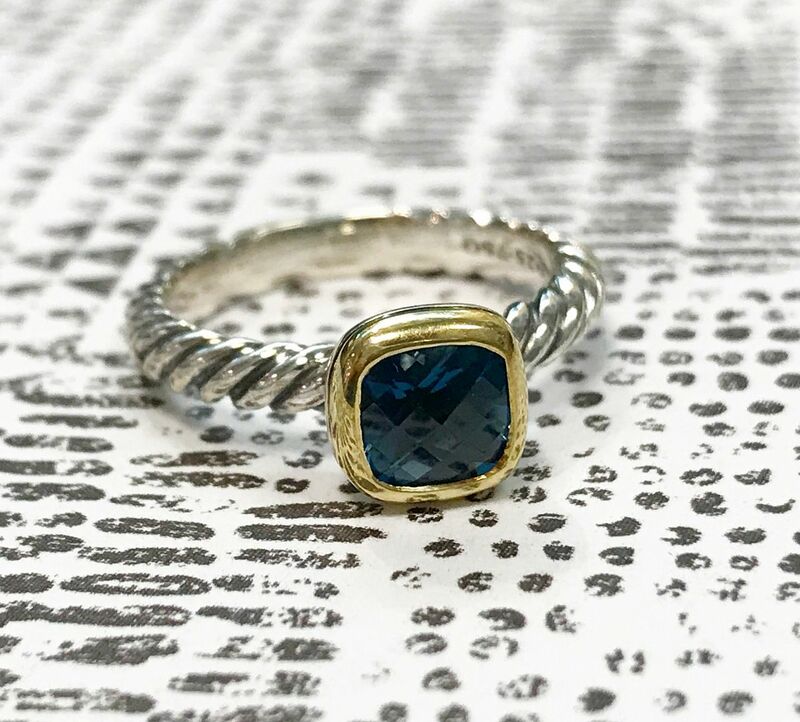 Tiffany and Co sterling silver and 18ky gold ring, $195. 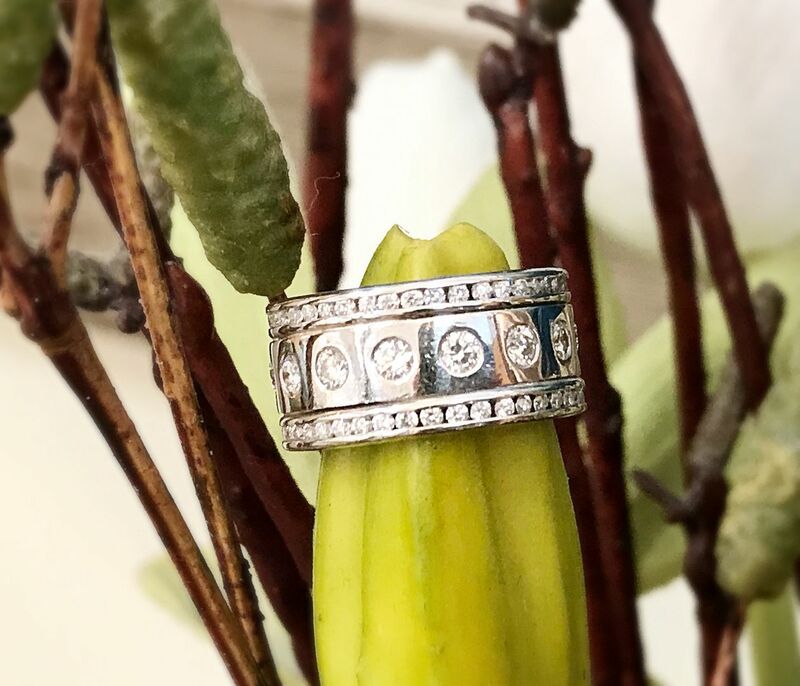 Sterling silver Tiffany lock ring, $150. 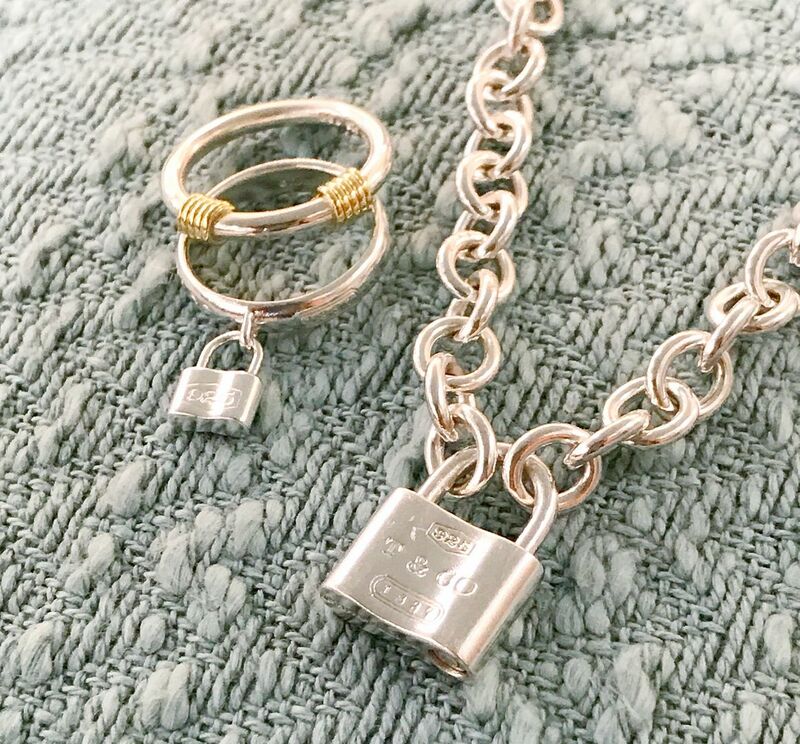 Matching Tiffany lock necklace, $295. 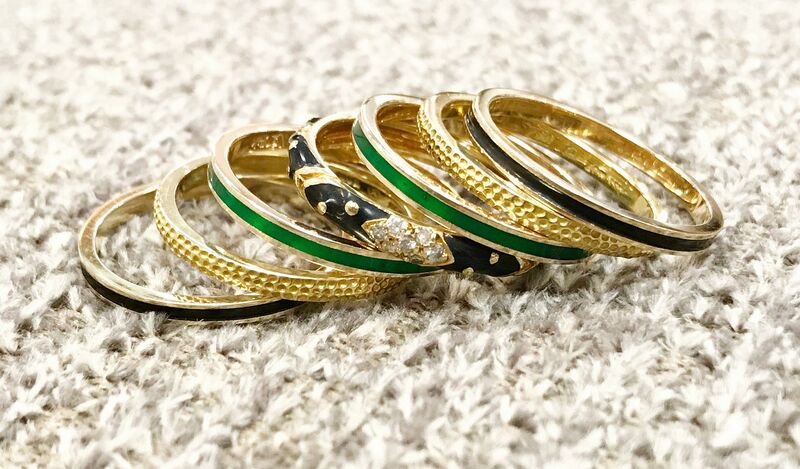 Such a cool 18ky gold and enamel ring stack. Prices range from $155 to $395. 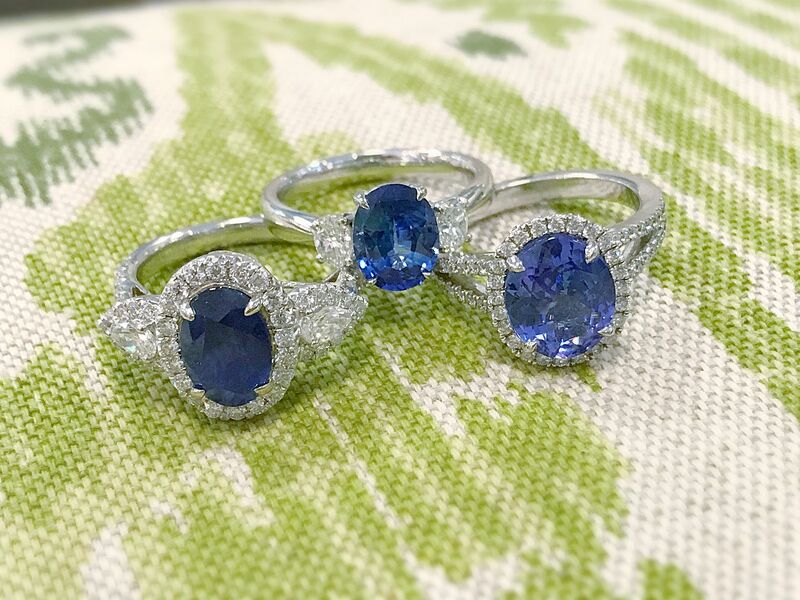 3.0ctw EGL certified natural sapphire with 1.17ctw in pear shape and round diamonds in 18k white gold, $10,395. 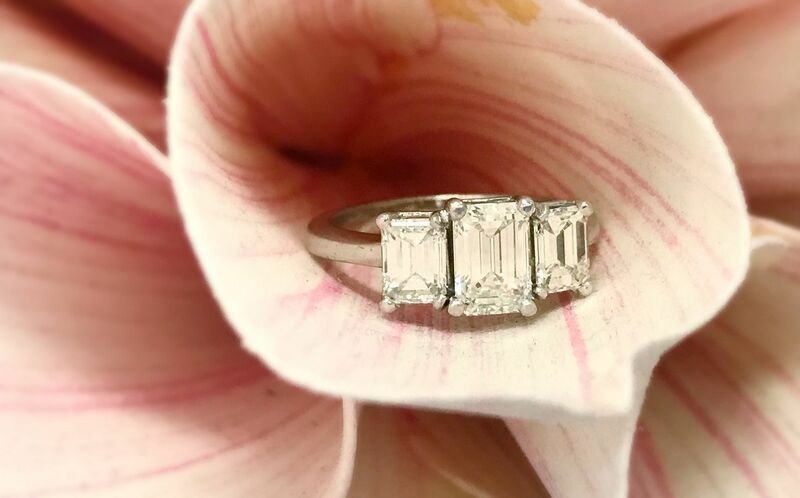 diamonds in platinum setting, $7,695. 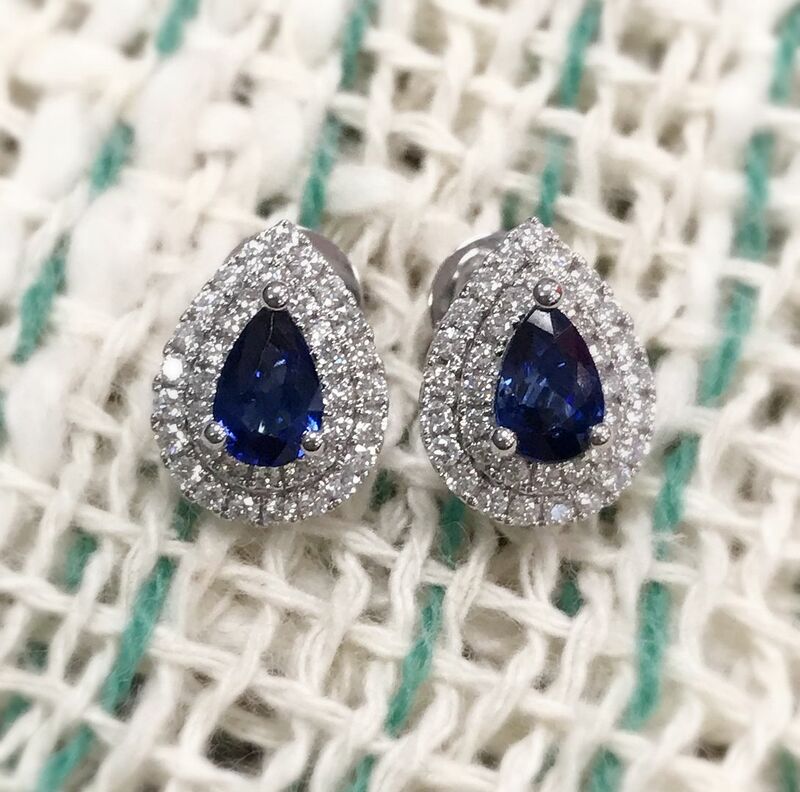 2.67ctw tanzanite with .48ctw round diamonds, $4,595. 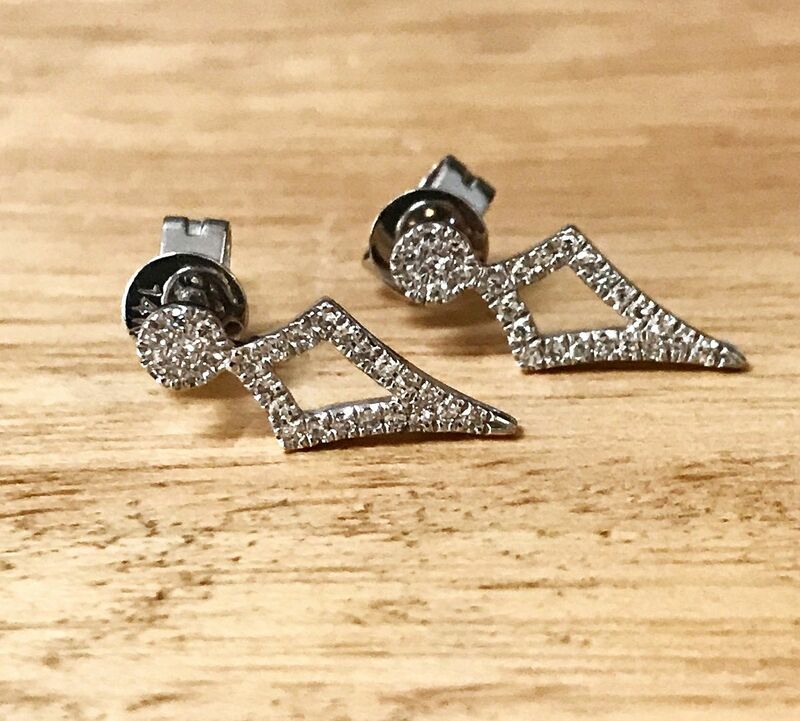 .11ctw diamond earrings in 14kw gold, $545. 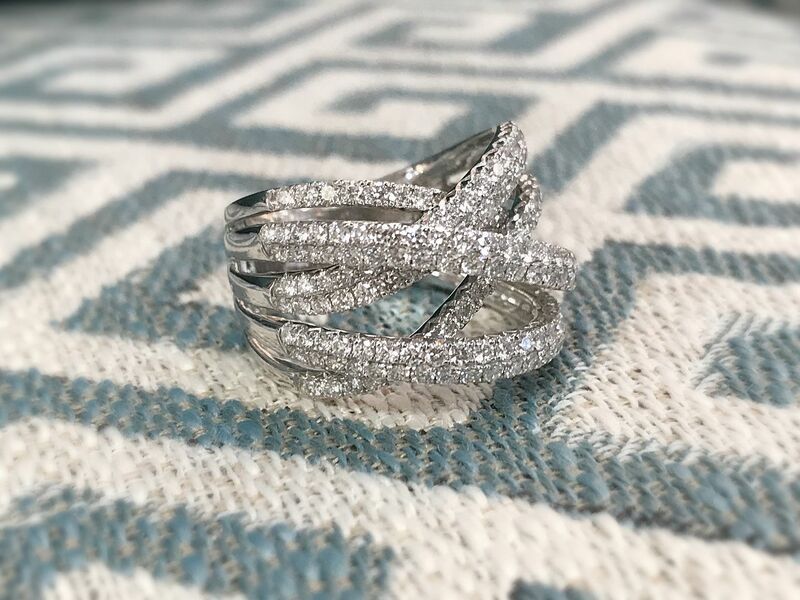 .88ctw diamond wide band in 14k white gold, $3,425. 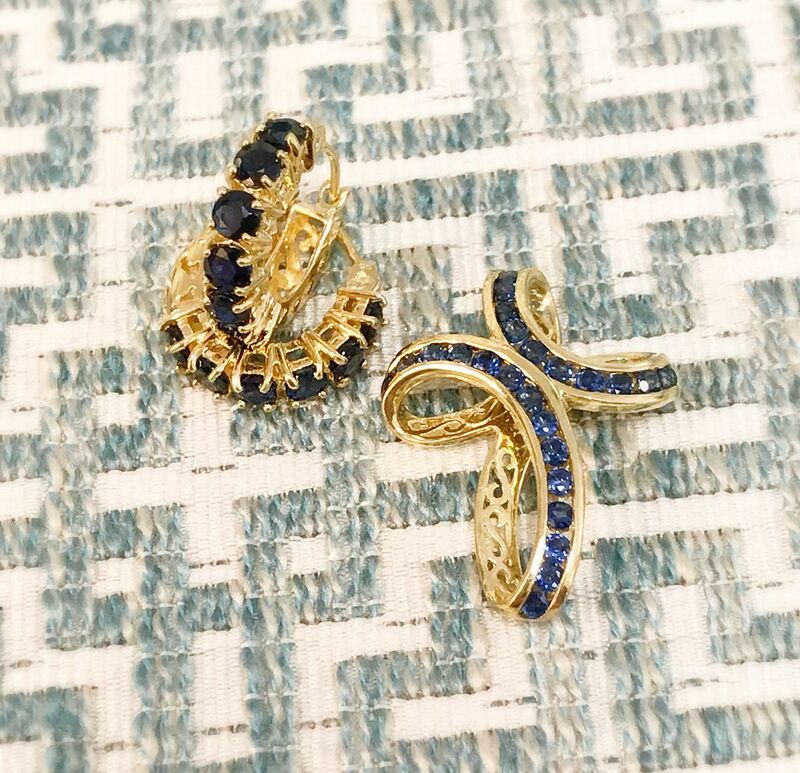 Check out all these sparkly new bands from Roman and Jules. Prices range from $1,495 – $5,835. 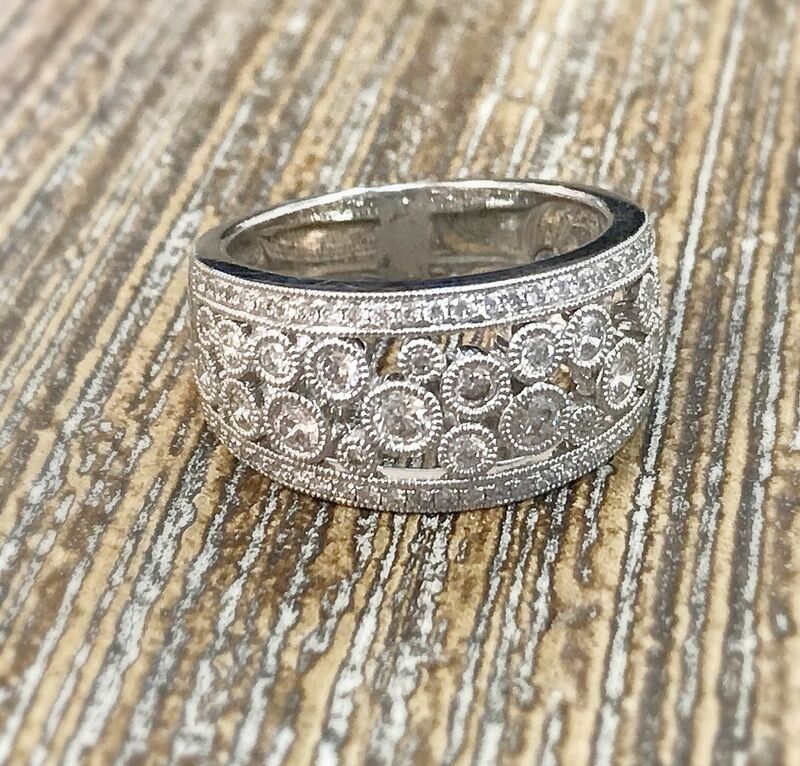 .12ctw diamond band in 14k white gold, $1,125. 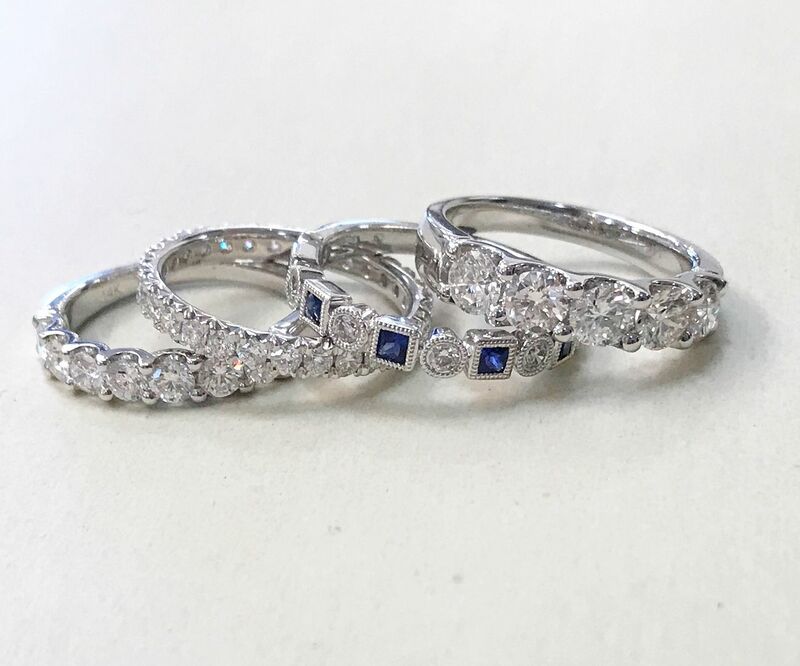 .22ctw diamonds bands, $995 each. 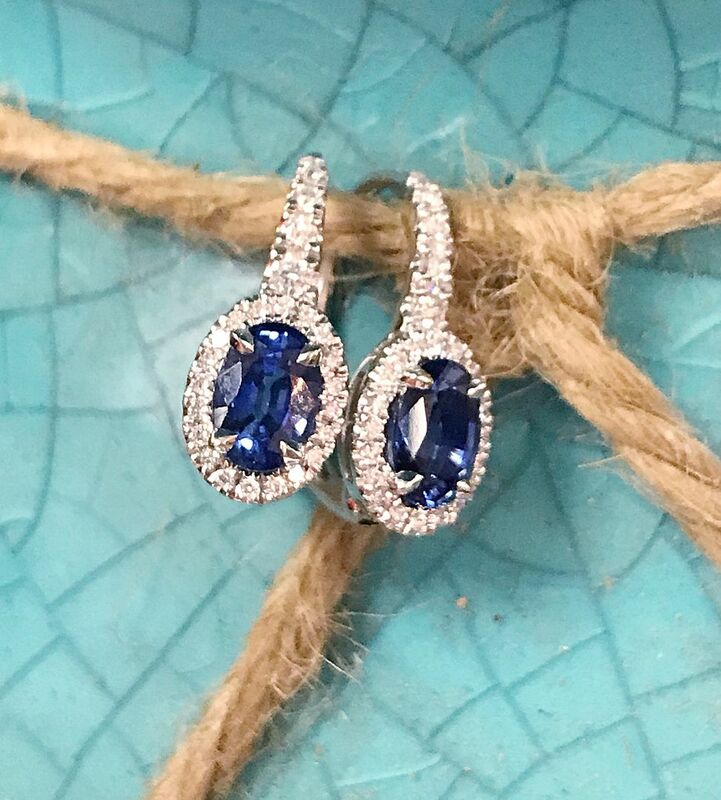 We are loving all these new consignments! in a .85ctw and 14kw gold setting, $5,995. 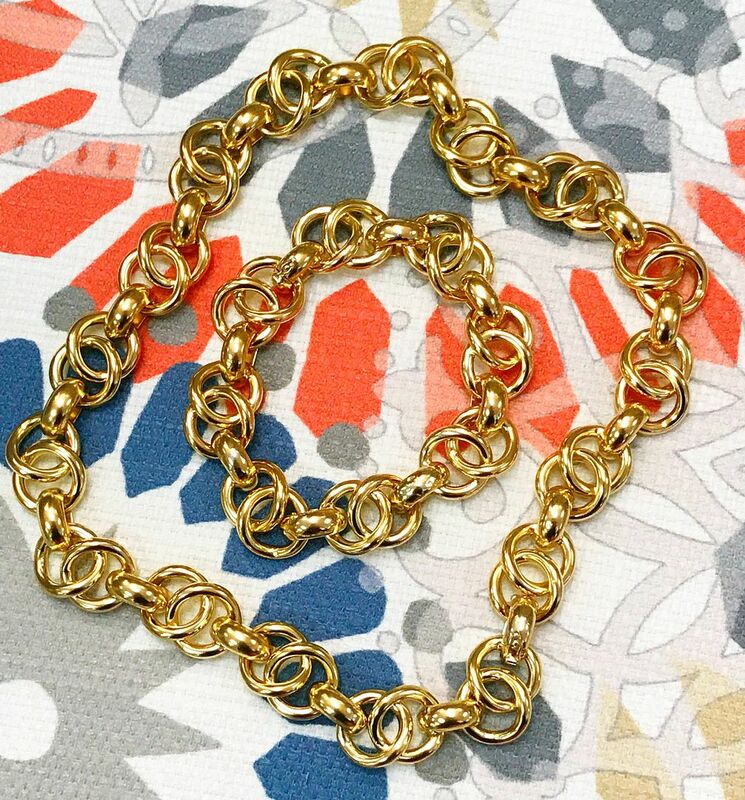 88.4 grams of 18ky gold in a .5″ wide link necklace, $6,395. 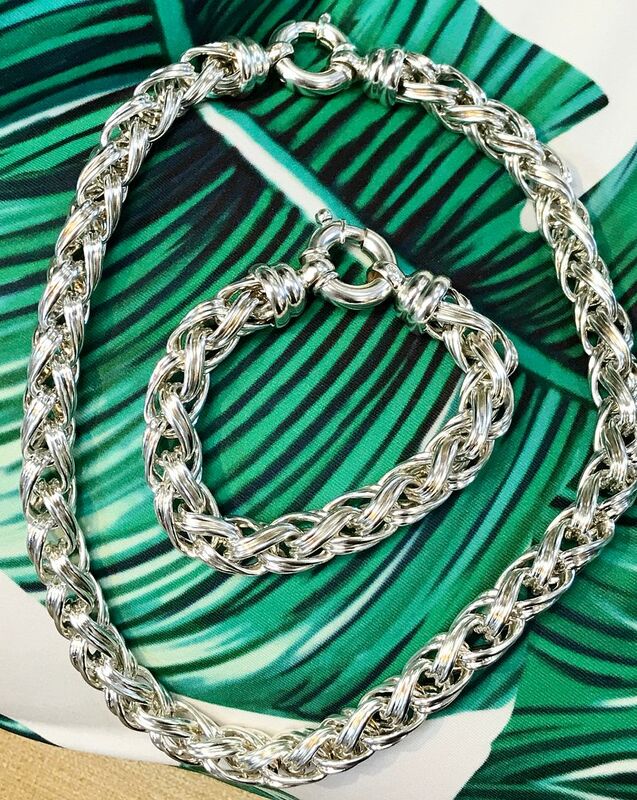 Matching 38 gram bracelet, $2,595. 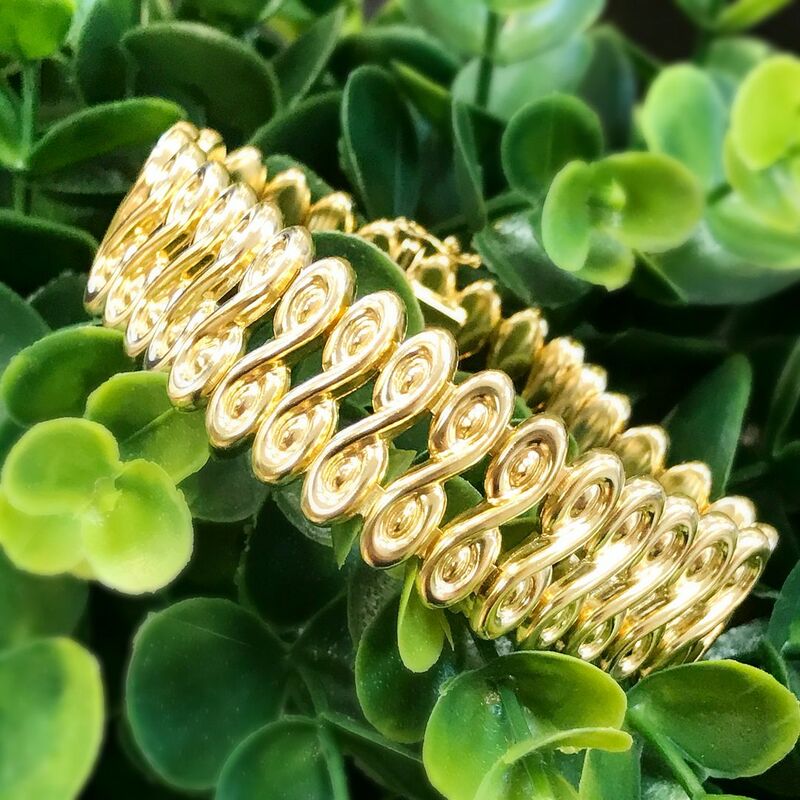 48 grams of 18ky gold in a .75″ wide 7.5″ long bracelet $3,395. Sapphire cross pendant in 14ky gold, $250. (Sorry, hoop earrings are sold). 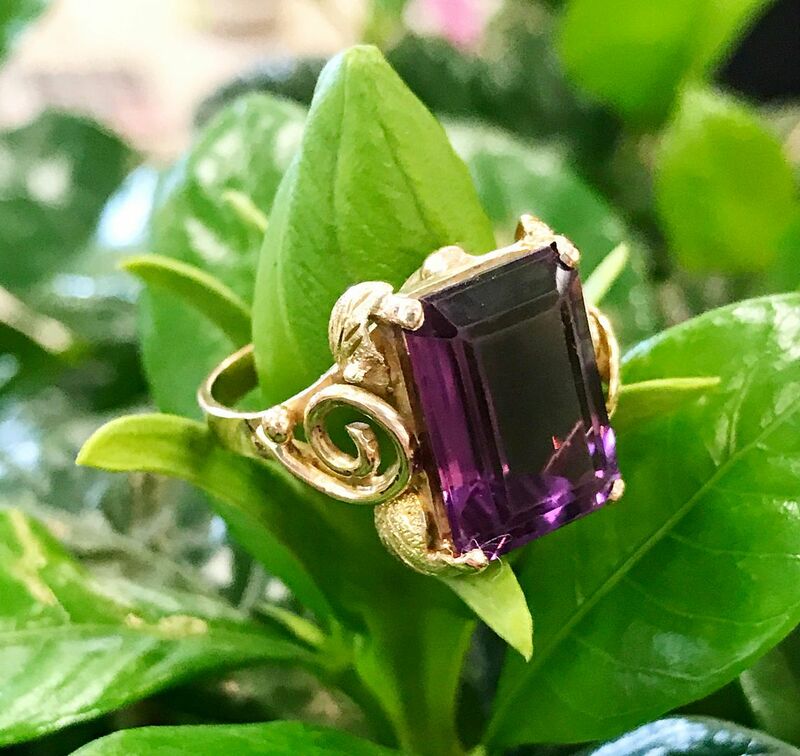 Amethyst and 14ky gold ring, $395. 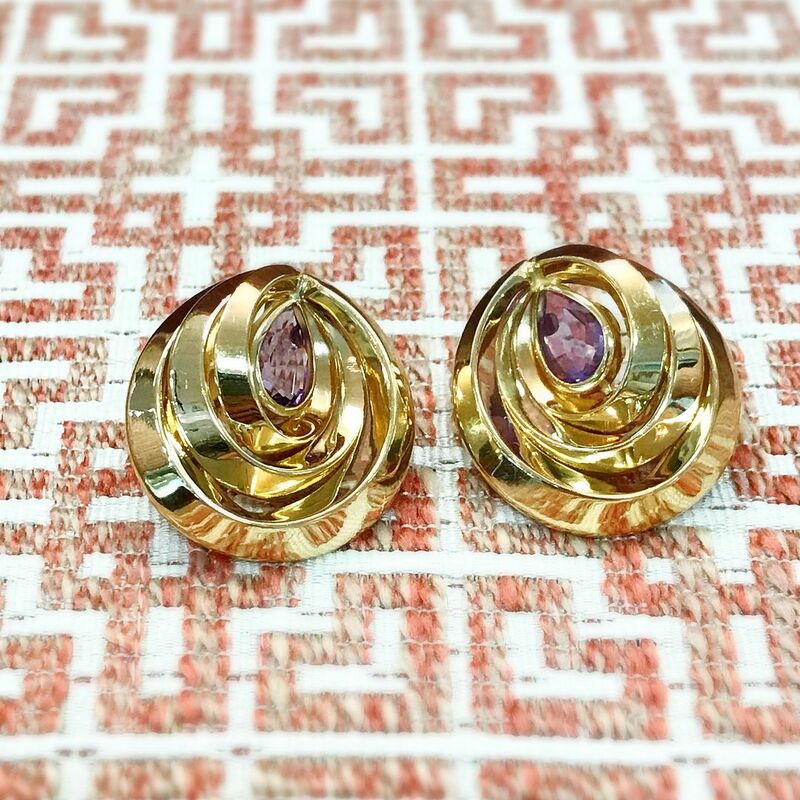 Amethyst and 14ky gold earrings, $295. 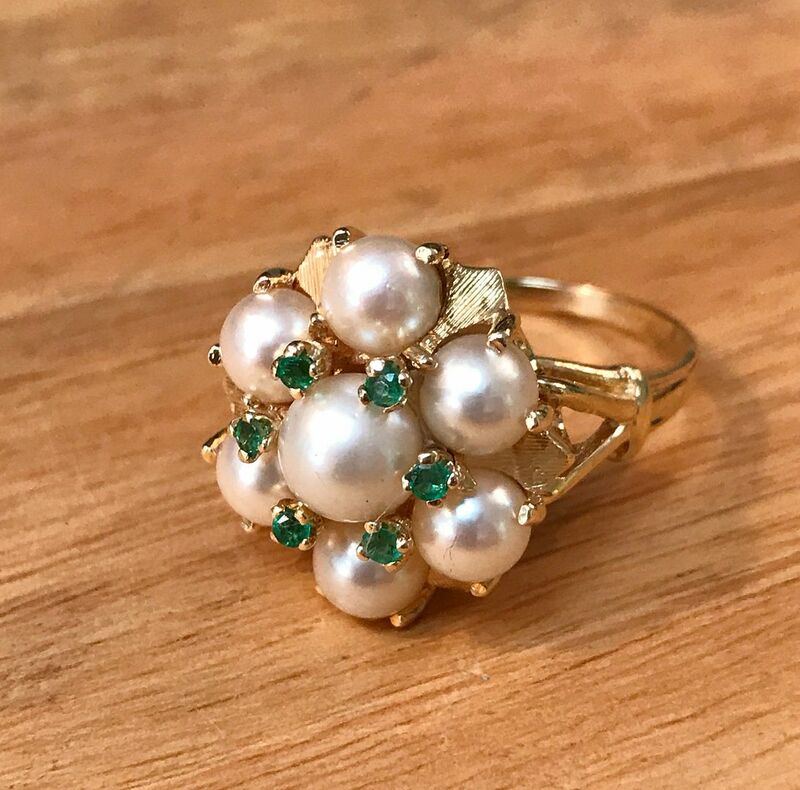 Pearl and emerald ring in 14ky gold, $595. 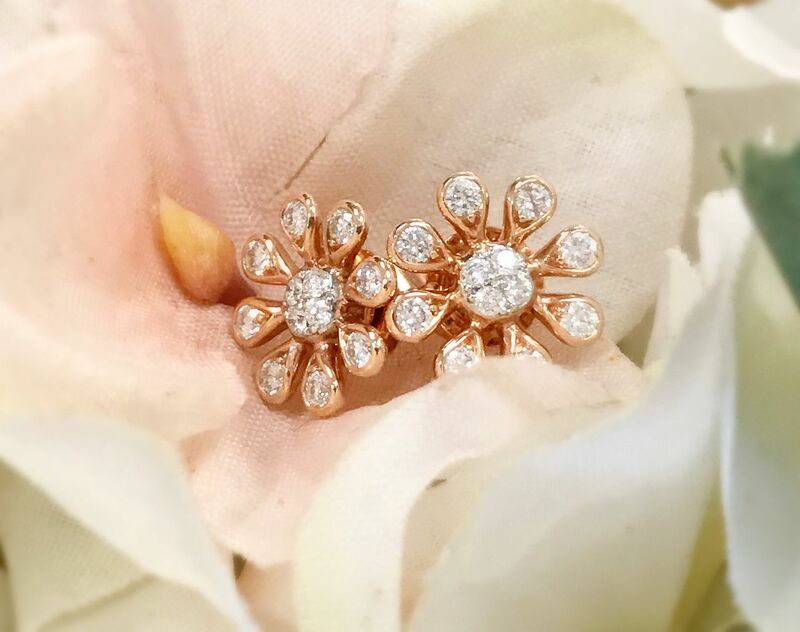 .45ctw diamond flower earrings in 14k rose gold. 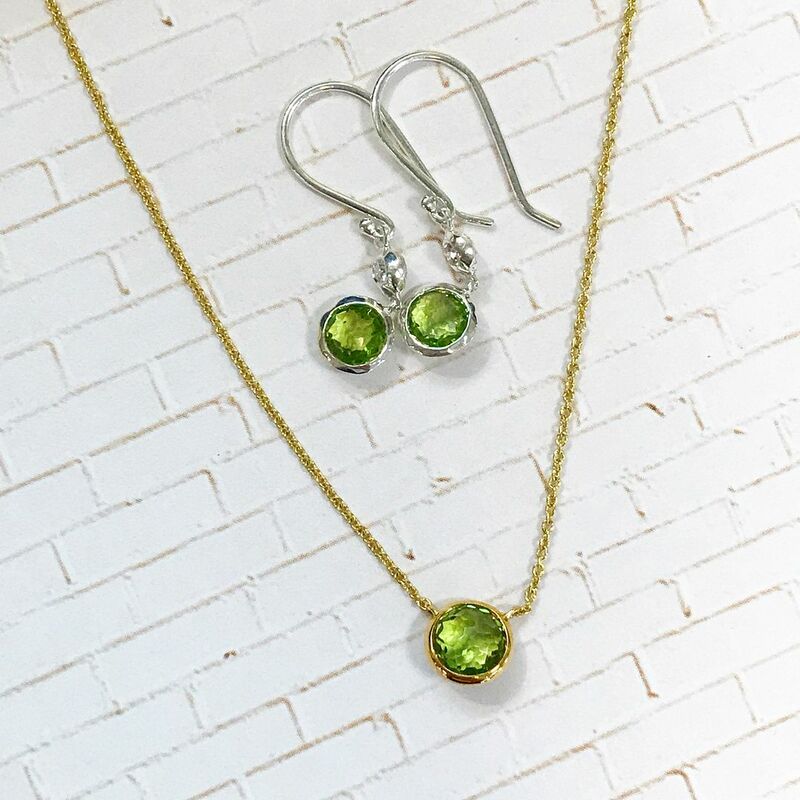 Peridot and diamond 14ky Le Vian necklace. 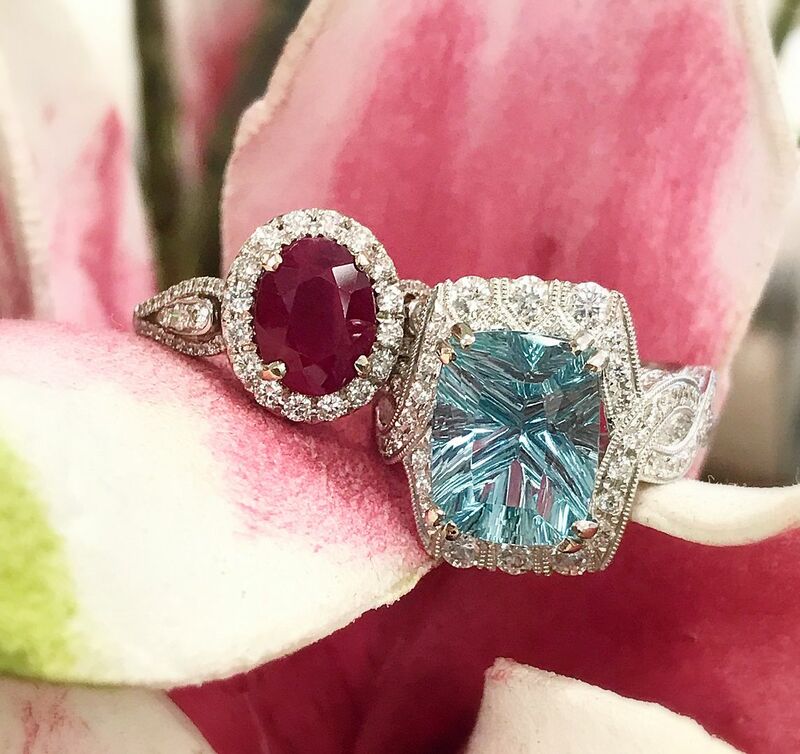 Le Vian diamond flower pendant. Was $1,995. Now $1,276. This weeks features from the sale case. Buy one at full price, and get one FREE! 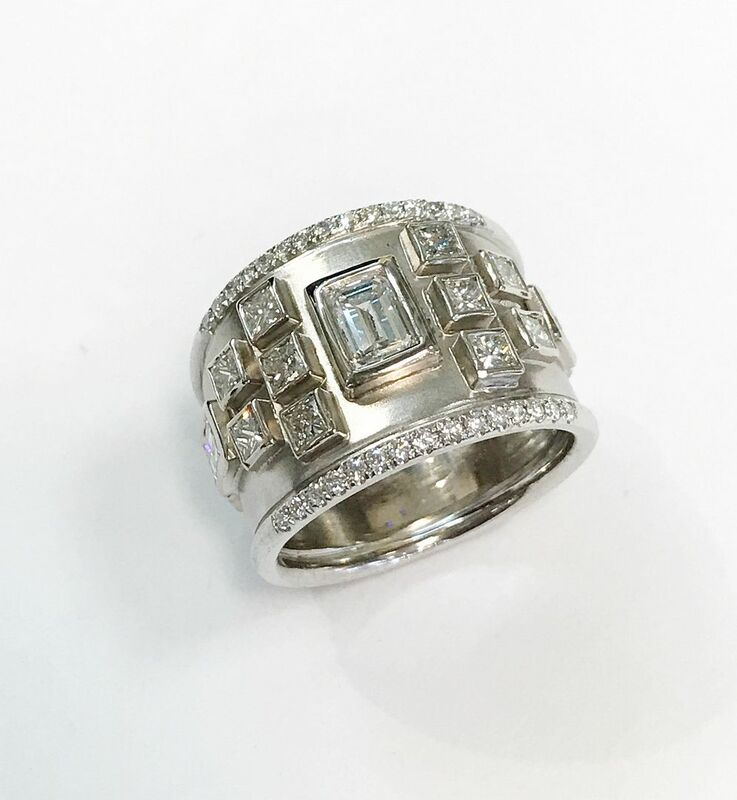 in a 1.34ctw diamond and 14kw gold setting, $6,795. 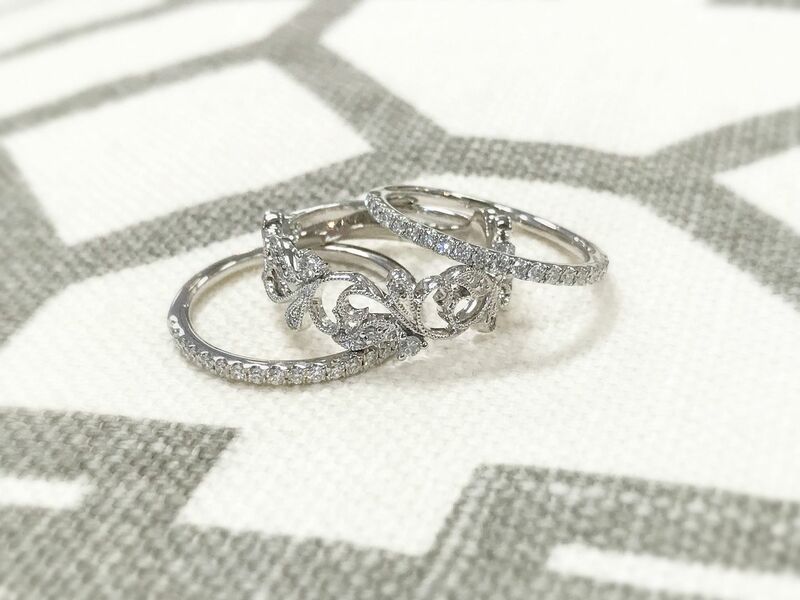 14k white gold oval hoops, $6,295. 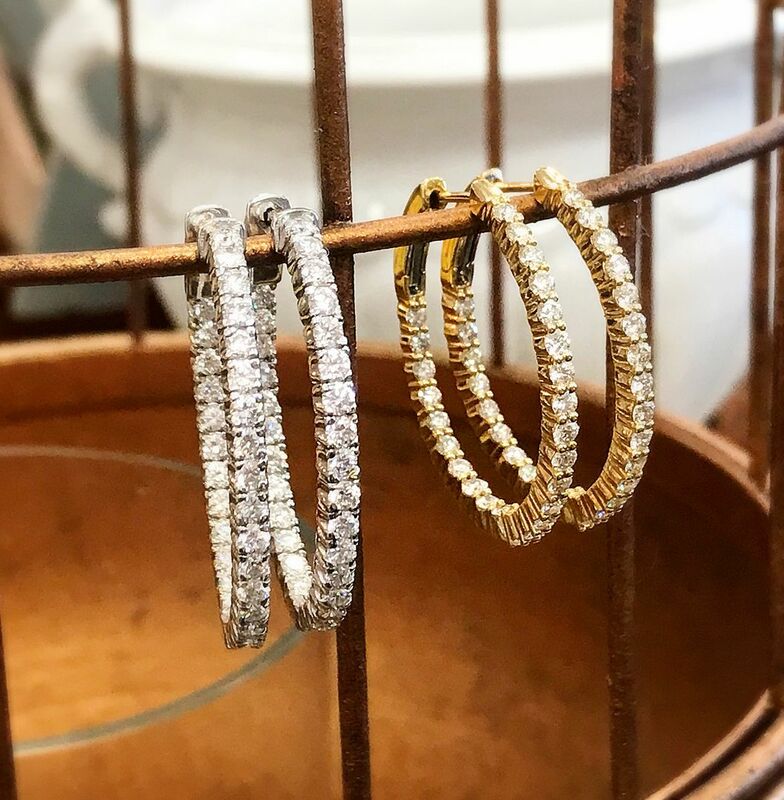 18k yellow gold oval hoops, $3,495. 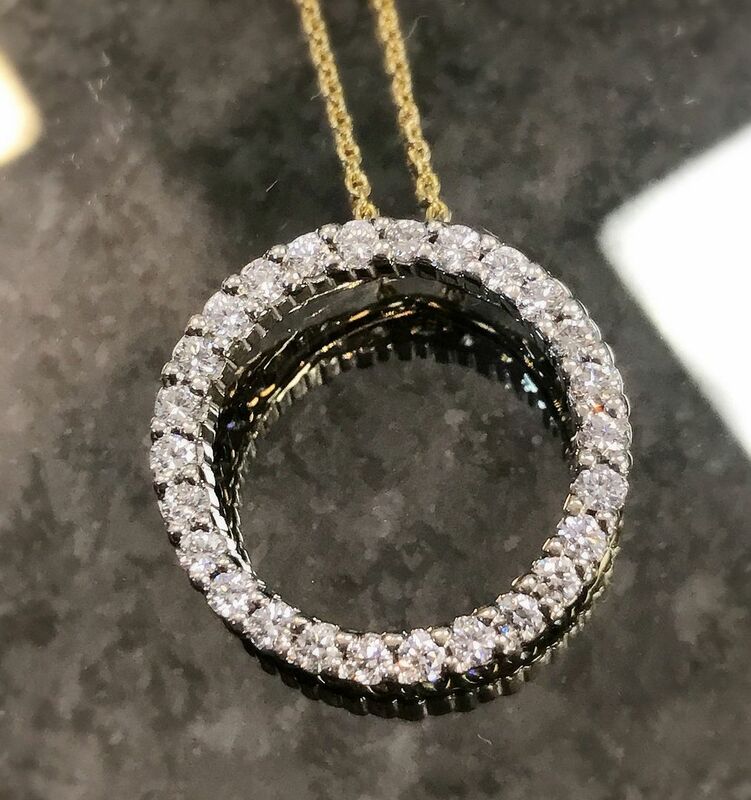 .86ctw diamond necklace in 18kw gold, $3,695. 14k two tone gold, $1,075. 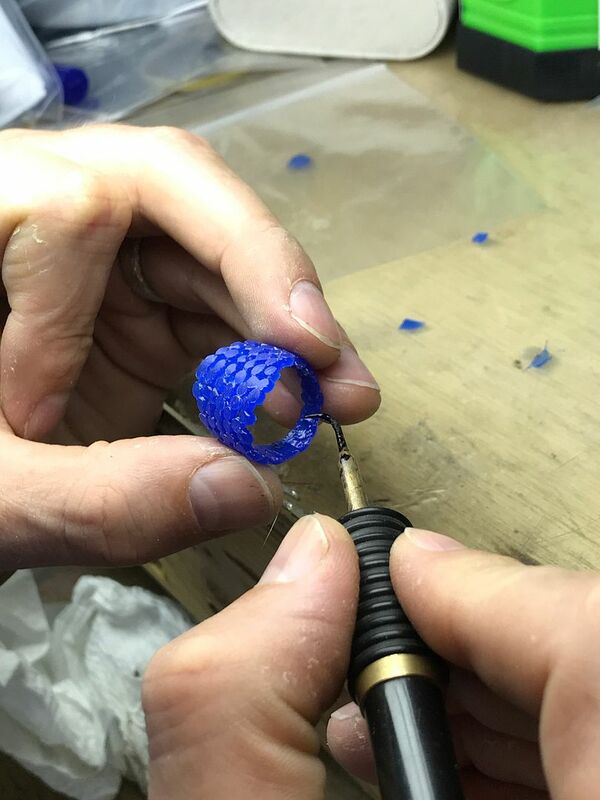 by melting beads of wax. We can’t wait to see this cast and finished. ring and couldn’t be happier with how it came out.